There are as many as 7,500 apples grown worldwide, and about 3,000 varieties of pears found around the globe. Nutritional content can vary depending on variety, as well as whether you're eating canned, fresh, dried or frozen apples or pears. As good sources of fiber, vitamin C, and various antioxidants, both apples and pears are great to incorporate in a meal or snack. Apples and pears are both rather low calorie foods considering the amount of nutrition they provide. One large apple contains approximately 116 calories, while a large pear contains 131 calories. These calories are essential for energy, and fruits like apples and pears provide a greater sense of fullness than a sugary snack because they also contain fiber. Both apples and pears are good sources of fiber. Women need about 25 grams of fiber per day, while men need 38 grams per day. Both fruits contribute significantly to this total, with a large apple containing about 5.4 grams of fiber, while a pear has about 7.1 grams. In addition to keeping you fuller longer, fiber lowers cholesterol and blood sugar and prevents constipation. An antioxidant, vitamin C plays an important role in growth and repair of tissue such as skin, ligaments, tendons and blood vessels. Apples and pears provide comparable amounts of vitamin C. Both provide about 10 milligrams of the essential nutrient. Women age 19 and older should get 75 milligrams of vitamin C per day, while the recommendation for men is 90 milligrams per day. While looking at a nutrition facts panel will tell you how healthful apples and pears are, further investigation into some nutrients that aren't listed on a typical nutrition facts panel only reinforces this notion. 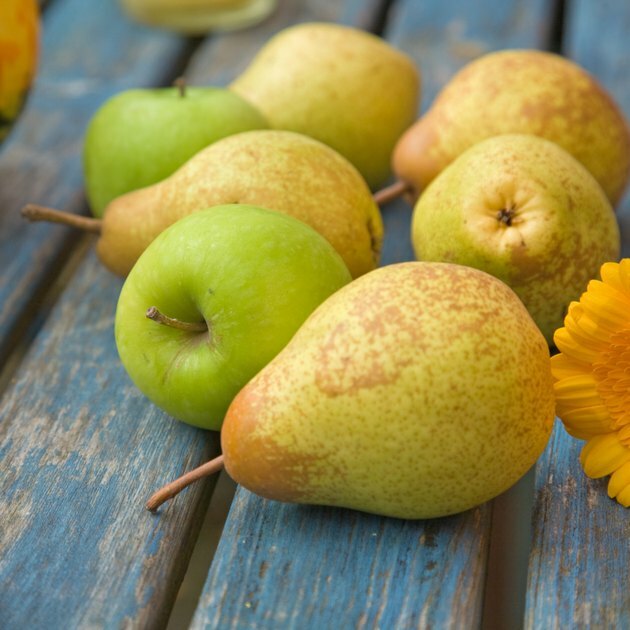 For instance, pears are loaded with phytonutrients, particularly flavonoids, which are natural chemical compounds that have been found to have disease-fighting properties. Apples also contain a healthy dose of polyphenols, another type of phytonutrient. In both fruits, eating the skin of the fruit is important, as this is where the bulk of the phytonutrients are found.